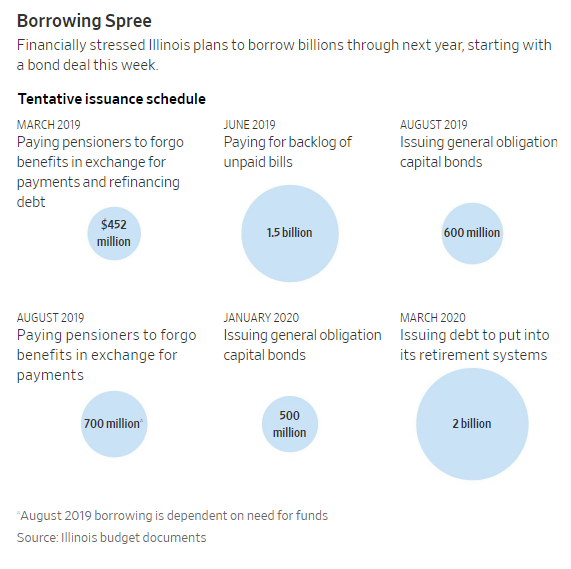 Illinois and its biggest city kick off hundreds of millions of dollars in borrowings this week, a test of investors' willingness to lend to stressed governments prone to spending more money than they bring in. The state launched borrowings with about a $440 million bond deal on Tuesday, followed by a sale topping $700 million by Chicago. Analysts expect what could be billions more especially from the state, as it puts together funds to do everything from paying retirees' pensions to launching capital projects. Before buying bonds from the nation's lowest-rated state and its biggest city, investors have to assess their continuing mismatches between expenses and revenues along with pension burdens, which are slated to eat up a growing share of both budgets in coming years. Municipalities nationwide are grappling with how to pay bondholders while also meeting the rising costs of retirement benefits, but few are as financially strained as the nation's third-largest city and the state. Illinois leaders have floated borrowing at least $4.5 billion more through next year, according to its financials. Rather than using most funds to build bridges or improve infrastructure, the Prairie State plans to use many of its bonds to pay off outstanding debts or put money toward pension benefits that have already been earned. For example, a proposed $1.5 billion borrowing tentatively scheduled for June would help pay for a pile of unpaid bills the state still owes. Lawmakers failed to pass a budget for two years under the former governor, worsening this backlog. Rahm Emanuel's last bond deal as Chicago's mayor will be used to pay off previous short-term borrowing alongside projects including sidewalk improvements and traffic signal installation. He considered selling $10 billion of debt to fund pensions, but it will be up to his successor -- elected this April -- to decide whether to move forward. Illinois's rating sits just above junk level. Chicago holds a speculative grade from Moody's Corp. and investment-grade scores from S&P Global Inc. and other firms. Chicago didn't hire Moody's for its latest bond deal. Despite their precarious finances, the city and state's leaders have turned to the bond market at what some analysts say is an opportune time. Investors have poured money into municipal bonds in recent weeks, vying for a relatively limited supply of debt, analysts say, and lifting prices while pushing down the yields of even some existing Illinois and Chicago bonds. That background helps ensure demand for the new bonds, analysts said, in the latest example of how investors' voracious appetite for debt can help governments find willing lenders despite fiscal stress. "The muni market is not showing a lot of discipline in pricing because there's so much money chasing so few bonds," said Justin Land, chief municipal strategist at Wasmer, Schroeder & Co., who said he owns both Chicago and Illinois bonds. The market is on track to record three consecutive months of net inflows to municipal mutual funds, sending the yield on the Bloomberg Barclays Municipal Bond High Yield Index to its lowest level since August in recent days, FactSet data show. But some said that despite the recent rally, it is too soon to tell whether political leaders including newly elected Gov. J.B. Pritzer can fix the ailing finances of the city and state. Including cash from an imagined Thompson Center sale in state budgets was so common it became a punchline. But Illinois Gov. J.B. Pritzker signed a law that finally puts the massive state office complex on the market. Illinois lawmakers have a history of inaccurately including the sale of one controversial Chicago landmark in state budgets. But state leaders could finally cash in on the aging state office building. Gov. J.B. Pritzker signed Senate Bill 886 into law April 5, granting Illinois authority to sell the James R. Thompson Center located in the heart of Chicago’s downtown Loop. Using revenue projections from nonexistent Thompson Center sales in Illinois budgets has become a routine accounting gimmick. Lawmakers included between $200 million and $300 million in revenue from a supposed Thompson Center sale in state budgets former Gov. Bruce Rauner signed into law for fiscal years 2017, 2018 and 2019 – despite never having been able to actually put the building on the market. While selling off the Thompson Center might make fiscal sense, lawmakers are mistaken if they view the one-time sale as any meaningful step toward restoring the state’s finances. In fact, despite Pritzker not anticipating a pending Thompson Center sale in his budget, the governor’s intention to outspend his predecessor is likely to grow Illinois’ annual deficit to over $3.2 billion. And while Pritzker says switching the state’s income tax from flat to progressive – on top of a litany of other proposed tax and fee increases – will achieve budgetary balance, no one outside the governor’s office has managed to replicate those findings. In the longer term, Illinois faces nearly $134 billion in pension debt and a more than $8 billion backlog of unpaid bills. Even by Pritzker’s overly optimistic revenue projections, a progressive tax hike would fund the equivalent of 118 days of state pension costs, or fewer than four months. Even if the General Assembly passes and Illinois voters approve a progressive tax hike, it would not be until 2021 that it takes effect. Illinois that year is scheduled to pay $10.5 billion in pension contributions and debt service, more than 27 percent of the state’s expected general revenues. Pensions will continue eating a larger share of state revenue, pushing taxes higher and leaving state workers with an ever-shakier retirement system. Pritzker must address the primary drivers of the state’s ailing fiscal condition if he ever wishes to achieve his goals of middle-class tax relief and sound finances. Instead of pursuing a progressive tax hike of which many are justifiably wary, Pritzker should spearhead constitutional pension reform to restore confidence in state retirement systems and state finances. Commonsense, bipartisan pension reforms similar to those advanced in 2013, when Springfield last saw a Democratic governor accompanied by supermajorities in both chambers, can set Illinois on the right path. A one-time sale of the Thompson Center and endless tax hikes cannot. It’s been talked about for years, but Democratic Gov. J.B. Pritzker on Friday moved the state closer to selling what many call an expensive eyesore, the James R. Thompson Center. Pritzker on Friday signed a measure that will make it easier to sell the often-criticized state building at 100 W. Randolph. The legislation was passed by the Illinois General Assembly in 2017 but was never sent to then Gov. Bruce Rauner due to a procedural hold. Effective immediately, the measure provides for the sale of the Thompson Center by a “competitive sealed proposal process within two years.” The buyer must also enter into an agreement with the city and the Chicago Transit Authority to maintain operations of the Clark and Lake station, which is one of the most complex and busy CTA stations in the city. The selling of the Thompson Center was not included in Pritzker’s budget but had been counted as proposed savings in Rauner’s past three budgets. The governor’s office vowed to get the sale done, while offering more parting shots at Rauner. Get the 100% fiber-optic network. By Verizon Fios — Get a Netflix premium plan for one year when you get a Fios Triple Play with a 2 year agreement. The newly elected Democrat’s administration’s plans to deal with an astounding $130 billion in pension debt includes borrowing money, deferring scheduled payments, transferring assets and using money from a not-yet-approved graduated income tax. Employees at the Thompson Center — who have often complained about its underutilization and maintenance issues such as water leaks — will be moved to the Michael A. Bilandic building across the street, and “other under-utilized, state-owned or rented facilities,” the governor’s office said. There are about 2,200 state employees who work in the building. The governor’s office also detailed a timeline for the sale, with the state to publish a Request For Proposal (RFP) within a year. Developers would then get four to five months to develop proposals. The state would decide on the developer within three months, and then negotiate and award a contract within two months. A model of the proposed State of Illinois Center, unveiled in 1980 by Gov. Thompson. The $89.8 million structure, which Thompson termed The first office building of the year 2000, will rise on the Loop block bounded by La Salle. Randolph. Clark and Lake. File Photo. A model of the proposed State of Illinois Center, unveiled in 1980 by Gov. Thompson. Thompson then called it the first office building of the year 2000. File Photo. But it’s been a love it or hate-it kind of building — a whopping 1.2 million square foot structure with a 16-story atrium. Almost immediately after the building opened, workers complained about problems heating or cooling offices surrounding the soaring open atrium. The longstanding argument to sell includes the fact that the building sits on an entire city block and the state pays nothing on property tax on its buildings. That means the city could stand to gain millions in property tax revenue should a private owner buy it. When he moved to sell it in 2017, Rauner said every state employee he spoke with wanted to work somewhere other than the Thompson Center. “It’s noisy. It’s a little bit smelly, you can smell the restaurants upstairs,” Rauner said. When the building was named in his honor in 1993, Thompson said he was proud of it, but he didn’t ignore its mixed reviews. And ten years later, when a sale was first proposed, Thompson raised no objections — even to the idea of a buyer changing the building’s name. Last edited by campbell; 04-07-2019 at 07:47 PM..
CHICAGO — The timing, size, and bonding levels of a sweeping infrastructure-funding package in Illinois remain unclear and are the subject of much debate for stakeholders banking on Gov. J.B. Pritzker to make good on his promises. “We must be prepared to make a big investment in our transportation and infrastructure with the passage of a capital bill that will be introduced in this legislative session,” Pritzker said when he unveiled his fiscal 2020 budget in February. The package, as Pritzker envisions, would be supported by a variety of funding sources and there’s strong bipartisan support for the spending. A three-fifths majority is needed for new bonding and the Democratic governor enjoys majorities in the House and Senate. As in most cases for state and local governments, where to get the cash remains an open question. The state is grappling with a more than $3 billion budget gap, an $8 billion bill backlog, and a pension contribution that consumed 19% of the general fund last year. The state's interest penalties remain high, with the spread on its 10 year bond around 175 basis points over the Municial Market Data's top-rated benchmark and nearly 100 basis points more than the BBB benchmark. While the depth of Illinois’ capital needs are being scrutinized at legislative hearings, some experts consider the planning process to be flawed. Those flaws and the strengths and weaknesses of short- and long-term funding mechanisms were recently discussed at the Chicago Civic Federation and Federal Reserve Bank of Chicago’s “Unlocking the Box: Best Practices for Financing Illinois' Infrastructure" conference. The state’s $31 billion 2009 Illinois Jobs Now capital program has mostly run its course. It relied on a series of transportation-related fees, fines, and taxes on candy, various beverages and liquor. It also legalized video gambling. Those sources have fallen short, requiring the state to dip into the general fund to repay general obligation borrowing costs. A new capital package took a backseat to the budget disputes between the legislature’s Democratic majority and former Gov. Bruce Rauner, a Republican, so many believe the time is now ripe to end the drought. On revenue, the state needs to tread cautiously to avoid straining its roughly $39 billion general fund, which could trigger a downgrade on its GO ratings which are just one to two notches above junk. On new borrowing, S&P Global Ratings will look at “what extent the debt might actually affect the operating budget at this point” and Illinois is in weak position to absorb much more debt, said panelist member Carol Spain, S&P’s lead Illinois analyst. S&P rates Illinois’ general obligation bonds BBB-minus with a stable outlook. A series of big-ticket items Pritzker proposed, led by passage of a measure to put a constitutional amendment to voters allowing for a shift to a graduated income tax from a flat one, have dominated the legislative agenda. With GOP lawmakers opposed to the graduated tax and resistance among some Democrats, many believe the capital budget and pet projects for local districts will be used as an incentive to support the graduated tax and the capital and operating budgets and graduated tax votes will all come to fruition late in the spring session. The clearest message that's emerged in recent months from the public and private sectors representing the education, transit, and road sectors is the acute need for an infusion of funding, and a big one. The Chicago Metropolitan Agency for Planning — the regional planning agency charged by local and state officials with holding the purse strings on federal funding — in its 2050 plan says an additional $24 billion of funding is needed to maintain the current regional transportation network, with $32 billion needed to upgrade it. “We are at a crisis point and the worst thing we could do now is settle for a short-term solution that will put us back in the same situation five or 10 years from now,” CMAP executive director Joseph Szabo said when the plan was unveiled. The Regional Transportation Authority of Illinois launched this month "get on board," a month-long campaign to drum up public support for a capital bill. The RTA, which has little remaining state authorized bonding capacity, has warned of a $2 billion to $3 billion annual shortfall over the next decade for capital. The state needs $13 billion to $15 billion for maintenance of state roads over the next decade, Illinois Department of Transportation officials told lawmakers earlier this year. Representatives and local school districts warned of overcrowding and the need to update school buildings. The state has a 15-year waiting list for 285 school district projects seeking financial help under the state’s school construction program in which the state will cover from 35% to 75% of the cost of an approved project. The Illinois Board of Higher Education gave lawmakers a list of projects public community colleges and universities are seeking that carries a $2.1 billion tab. That’s scaled down from $4 billion of projects the schools need to maintain facilities and build new ones. The backlog of deferred maintenance has “ballooned from $2.7 billion to $6.7 billion,” Nyle Robinson, the board’s interim director, told lawmakers. To underscore the state’s dire needs, advocates of an Illinois capital bill used the closure in February of the 33-year-old Lake Shore Drive bridge in downtown Chicago after cracked steel beams were discovered. “Infrastructure is not optional. It's a public safety issue, stupid,” Bank of America Merrill Lynch’s analytical team says in the firm’s April 5 Municipals Weekly piece. The report, authored by municipal research strategist, Ian Rogow highlighted the alarms being set off with increasing frequency over bridge collapses and other infrastructure failures. Most recently it was the collapse of a Chattanooga, Tenn., bridge which coincided with the release of the American Road & Transportation Builders Association annual deficient bridge study. About 7.6% of the nation's 616,087 bridges are structurally deficient. Projected repair costs are $171 billion. Illinois ranked 6th in the size of the tab, about $5 billion, to fix its deficient bridges. With pension funding demands eating up more resources, infrastructure is being crowded out. “So, what could it take to increase investment? Two things potentially: lower required pension contributions and, unfortunately, perhaps the surfacing of greater safety issues,” the report said. Sen. Andy Manar, D-Bunker Hill, and Sen. Martin Sandoval, D-Chicago, are hosting hearings through April to build the case. “This is not going to work unless we have the ability to pay for it and that’s going to take a broad and difficult conversation,” Manar said. With a new federal infrastructure package making little headway, local tax hikes have the support of some key business organizations while public surveys show taxpayers don’t want to dig further into their own pockets. Various groups and political leaders are pushing a motor fuel tax as an anchor for the capital bill even though experts say it’s a weak fix given the shift to more fuel efficient and electric vehicles and changing trends with car ownership. Illinois has not raised its 19 cents per gallon motor fuel tax since 1990. Every five-cent-per-gallon increase in the motor fuel tax generates $20 million for Chicago and $250 million statewide. Michigan, Wisconsin, and Minnesota governors have fresh proposals on the table, but with divided political leadership each faces a tough road. Ohio, which is led by the GOP, last week adopted an increase although it fell short of the governor’s original proposal. Chicago’s outgoing Mayor Rahm Emanuel and his counterparts in the region recently called for a 20- to 30-cent-per-gallon increase in the motor fuel tax and to index future hikes to inflation. Other increases in traditional transportation funding sources, such as license fees, should be on the table, he said. The Illinois Chamber of Commerce drafted what it calls a "modernization program" that would raise $2 billion annually for transportation. It includes a $4 billion bonding authorization to accelerate bridge improvements. The proposal would phase in a hike that would bring the motor fuel tax to 44 cents from 19 cents, raise some registration fees while lowering others, and raise the registration fee for electric vehicles to bring it in line-with commercial vehicles. Another proposal on the Senate side would raise the gas tax to 38 cents and raise driver licenses and vehicle registration fees to generate nearly $2 billion annually. The 2016 constitutional amendment lock-boxing transportation-related public revenues would protect the allocation of new tax revenue and require multi-year spending plans. While congestion pricing advances in New York, Oregon and California are at the forefront of considering miles-per-traveled fees and “every state really ought to be considering this,” Hamer said. “There’s no one singular option” with tax-increment financing (TIFs), road user charges and public-private partnerships all playing a potential role. Asset concessions fell out of favor locally due to the bitter taste left by Chicago’s flawed 2008 parking meter system lease, but a P3 for new assets has benefits if the public can be convinced. “We need to look at all of our revenue streams and we also need to look at how we deliver projects more efficiently and how we … manage long-term risks and shift those risks to the private sector who can better manage them,” said panelist Mitchell Holzrichter, a partner at Mayer Brown LLP. Some have suggested a lease of the Illinois toll road but it has complications as proceeds would be limited to transportation use under the lock-box amendment. A $20 billion to $30 billion valuation could be tough for the market to digest, the panelists said. The state proposed its first P3 in a toll-supported managed lane project but it’s been slow going. CMAP has proposed a series of revenue measures to leverage an additional $56 billion over its 32-year planning period. It relies on an initial gas tax hike with then a shift to a per-mile traveled charge to replace the state’s motor fuel tax along with other proposals including expanding the state’s sales tax to some services, and implementing a special regional revenue tax from a source like the gas tax or registration fees to leverage federal dollars. The Chicago Transit Authority has turned to the federal TIFIA program, established a first-of-its-kind TIF corridor and borrowed to make do amid a lack of state capital and declining state operating subsidies, said conference panelist Dorval Carter, president of the Chicago Transit Authority. The gas tax is a start, but he sees New York’s recent adoption of a congestion pricing model for Manhattan and the growing interest in ground transportation tax changes as potential sources. The sticking point is they “require a certain level political willingness,” he said. Illinois sorely needs a capital planning process with a sustainable revenue plan to replace the current structure where projects are views as goodies to be doled out in exchange for other votes. Leveraging federal dollars and incentivizing innovation should be core pieces of any capital plan, said panelist Tom Kotarac, vice president of Transportation and Infrastructure for the Civic Committee of the Commercial Club of Chicago. A sea change is needed for Illinois and others where maintenance cost “for the life of the asset” — which can’t be built into bond proceeds — is factored into the financing equation, said conference panelist Michael Pagano, dean of the University of Illinois at Chicago’s College of Urban Planning and Public Affairs. State politicians are ready to go on another borrowing binge. According to a recent S&P presentation given to bankers and other government officials, Gov. J.B. Pritzker wants to borrow another $6 billion from the bond market over the next year. It’s part of his plan to hike taxes, borrow and extend debt repayments to plug the state’s budget holes. As a banker present at the meeting told me, even the financiers were caught off guard by the amount and the timing of the debt. The question is, “when will too much debt finally be too much?” As the Wall Street Journal recently reported, Illinois already contributes more than 25% of state revenues toward pensions and other debt, and it would jump to over 50% if Illinois paid the proper amounts. Illinois is the nation’s extreme outlier when it comes to too much debt and you have to wonder how far the state can push it before the game ends. The new borrowings, which still need legislative approval, represent a nearly 20 percent increase over the existing $30 billion the state already owes in general obligation bonded debt. What’s on tap, according to S&P? Look for the status-quo pundits to say that all this new borrowing is good. That it refinances more expensive debt, like unpaid bills, and that it helps replace some of the pension debt outstanding. But anybody who’s been following Illinois knows that more debt simply begets more spending and more debt. It’s how Illinois has ended up with the nation’s worst pension crisis and $234 billion in unfunded liabilities, according to Moody’s. It’s how the state racked up another $73 billion in retiree health insurance obligations, all of it unfunded. And Illinois’ bonded debt burden is already one of the nation’s highest, according to the S&P presentation. Borrowing more to “fix” the state’s debt problems is precisely what’s gotten Illinois into this mess and Pritzker seems set to continue the trend that was started by former Gov. Jim Edgar’s pension ramp and perpetuated by Govs. Rod Blagojevich and Pat Quinn’s pension obligation bonds. Nevertheless, it’s clear Illinois hasn’t reached an inflection point yet. A demand for municipal debt nationally, a goldilocks U.S. economy and low rates globally mean investors are still looking for high interest rates anywhere they can get them. Illinois and the premium interest rates it must pay gives them just that. But the good markets can’t be expected to last forever. Expect more eyebrows to be raised as the debt load gets bigger and the markets get dicier. Every Illinoisan Must See These Two Charts In The Wall Street Journal – For the state, about 25% of revenue now goes towards pensions and other debt, but that would jump to over 50% if proper amounts were being paid. Moody’s vs. Illinois politicians: $100 billion difference in pension debts – Moody’s recently released what fiscal realists would say is the true estimate of Illinois’ unfunded state pension liability – $234 billion. Illinois’ other debt disaster: $73 billion in unfunded state retiree health insurance benefits – Illinois owes another $73 billion in retiree healthcare debt and doesn’t have a single dime set aside to pay it. Gov. Jim Edgar’s starring role in Illinois’ pension crisis: It’s bigger than just the “Edgar Ramp” – The bipartisan compromises Edgar championed are responsible for turning the state’s pension problem into a full-blown crisis. Special Report: Illinois state pensions: Overpromised, not underfunded – Illinois’ pension crisis is the result of overpromised benefits, not underfunding by taxpayers. Now offering online seminars, live seminars, and everything else under the sun and over the moon for actuarial exams.